CAFOD Campaigners are going to London to end Global Hunger! – Join in to play your part. 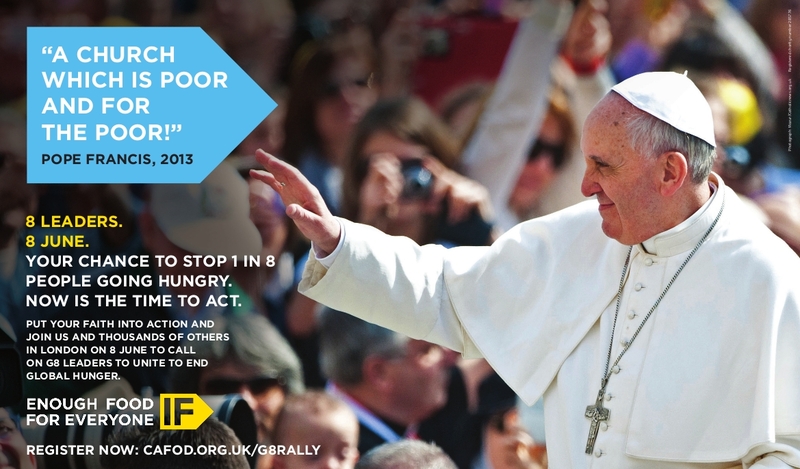 CAFOD Campaigners will be joining thousands of others to tell the G8 to act on global hunger. Campaigners from groups including CAFOD,Christian Aid, Oxfam, Save the Children and Tearfund are travelling together to London for the ‘Enough Food For Everyone’ Event at Hyde Park on June 8. Anyone wanting to take part can now make use of three coach services, organised by CAFOD and the local coalition, leaving from Plymouth and Exeter. The service from Plymouth will leave at 7.00 am from Plymouth bus station and arrive at its second stop, Buckfast Abbey, at 7:30 am. The Exeter service will leave at 7.30 am from the Okehampton St. Car Park and arrive at its second stop, Sainsbury’s Hankridge Farm, Taunton, at 8:10 am. This entry was posted in Campaigning, National CAFOD Event and tagged advocacy, aid, aid work, CAFOD, CAFOD PLYMOUTH, Campaign, Enough food for everyone IF, IF, News, Plymouth by damien101. Bookmark the permalink.